If you want to save on public transport expenses during your trip to Brussels, Belgium, be sure to buy a Brussels Card. This card combines public transport with sightseeing. The bonus is that you save money and spare yourself a lot of hassle because you needn't buy separate tickets for transport and museums. 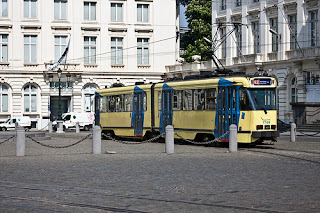 Brussels is a walkable city with an excellent public transport system. Metro, trams and buses criss-cross the city. The metro has three lines; 1A from Roi Baudouin to Debroux, 1B from Erasmus to Stokkel and Circular 2 from Simonis to Clemenceau. Trams run north – south through the city centre, connecting Noord / Nord, Central and zuid / midi stations. Central Station and Bourse are the main transport hubs. Single tickets allow passengers an unlimited number of changes for one hour. They can be bought on buses and trams. You can also buy a booklet of five or ten single tickets. They are valid for three years and are cheaper than a single ticket. Tickets bought on the bus or tram are slightly more expensive than those bought at a kiosk. Single tickets and bookets are gradually faced out and replaced by the MOBIB smart card. The Brussels Card is combination of free transport and sightseeing/discount. The card consists of two tickets. One ticket allows you free entrance to museums. The second ticket is to be used on public transport and has to be validated every time you hop on a bus, tram or enter an underground station. The Brussels Card allows you to travel 24, 48 or 72 hours on trams, buses and metro, with the exception of lines 12 and 21 between NATO and the Airport. It also gives free admission to 32 museums, €6 discount on the hop on hop off bus and 25% discount when you buy Godiva chocolates. You will get a free drink, a second beer or a free dessert in some restaurants. The price includes free transport, free entry to museums, a city map and an information booklet with addresses of shops, restaurants and attractions that offer discounts. You can buy the Brussels Card online, in tourist information offices at Grote Markt/Grand Place and Zuidstation/Gare du Midi in hotels, museums and at City2 Shopping Mall at Nieuwstraat/Rue Neuve 123.